As I’ve watched my older child steadily outgrow his food allergies, or at least those known allergies where we’ve been able to gradually increase his tolerance through small and safe amounts, it has apparently given me a false sense of security for my baby’s food allergies. This all came crashing down on Thursday. A couple of months ago we had done some early testing for our baby. Some doctors won’t test so young, as both skin and blood testing in infants is not always recommended due to the likelihood of inaccuracies. False positive and negative results are not uncommon, and generally waiting until a child is older can yield more accurate, and therefore definitive, information. For instance, at different times both of my boys had tested positive for peanut allergies on their initial skin and IgE blood tests, then negative on the peanut component test – a more advanced blood test – which led to food challenges which they both passed. But our allergist will do early testing in the right circumstances and considering the history of known food allergies in the older child, we figured the baby would have something going on. I suspected a milk allergy which was confirmed in testing. What I didn’t expect was a sesame allergy. As it was a low positive on the IgE blood tests, I didn’t take the results as definitive. The doctor told me that it could be true or not, and that I could try to give tiny amounts of sesame at home to see if he could tolerate it. I left with another Epipen Junior prescription and what I thought was a solid enough action plan. The baby loves food in a way that his toddler brother still doesn’t. If you put him in his high chair without food ready for him, he gets audibly pissed. He doesn’t want to be spoon fed and will not eat purees at all, but is happy to jam food into his face/general mouth area, hair and ears all by himself. Following the doctor’s instructions, I had given him sesame oil on several occasions without incident and figured that we were in the clear on the sesame allergy. Thursday, as my toddler happily ate pita chips and hummus, he asked me if his brother could have one and I said “yes.” The baby happily sucked the hummus off of the pita chip and began gumming the chip. This happy state fell apart very rapidly. Within minutes of eating the hummus A began to cry and grab at his ears. Worried that this may be the start of an allergic reaction, I grabbed a wet paper towel and wiped off his face and asked the nanny to wash his hands while I went looking for the Benadryl just in case. O, the toddler, had immediate reactions to eating milk products as a baby as well as contact reactions to egg, so I figured that Benadryl was in order and would stop the itching for A as well. He came out of the bathroom with the nanny who very calmly told me he was having a reaction. I gave my red faced baby Benadryl, but he was ramping up the crying and his face and hands were being overtaken by hives. I started shaking as the crying increased. Generally when I’ve given Benadryl to my older son during a reaction, it’s not an immediate cessation of symptoms, but they do tend to stop getting worse. Not in this case. The nanny, who used to work in a daycare and has been trained for emergencies like this, very calmly and firmly told me I needed to give him the Epipen. I called the allergist’s office while I got the Epipen out of the case and ready to go. 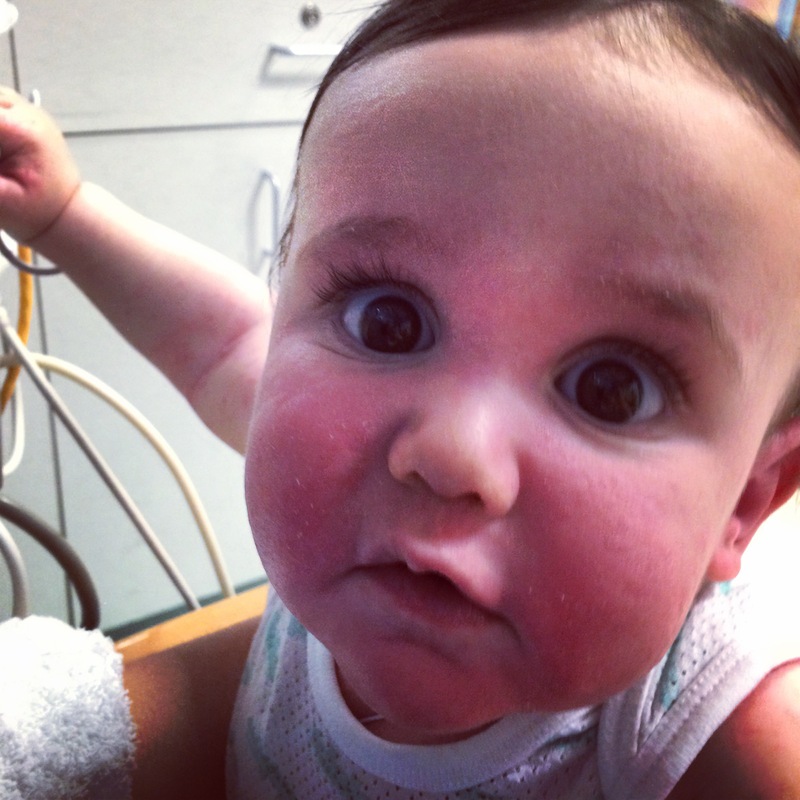 I knew that she was right before the doctor came on the line; my baby’s lips had started to swell as well as his face. The doctor told me I needed to give it to him right now. With shaking hands I held my less than a year old baby in my lap and jabbed the Epipen into his leg, counting to 10 over the sound of his pained wail. As I grabbed my keys to head to the emergency room my toddler, who had watched all of this from his high chair at the same table, began to cry. I gave him a kiss, grabbed a diaper bag that I discovered on arrival at the hospital didn’t actually have anything useful in it at all, and headed out the door. My neighbor who is a physician told me I should call an ambulance but I decided in that moment that it was better for me to drive, that he would be better off in his car seat and that I could choose the ER at the childrens hospital instead of the closest ER. Driving myself was a mistake. Hitting traffic on the way to the ER with an infant in the back that I can’t see or monitor was nerve wracking. I wanted to scream at all of the cars to get out of my way, but that’s clearly the job of the siren on the ambulance I should have called. I arrived at the parking garage of the hospital and was directed to an open spot so I could get the baby inside. Once up the elevator I hit two more lines before I flagged a nurse down and told her I had given the baby an Epipen 30 minutes before. I was checked in very quickly and immediately seen. The baby was placed on monitors and I was told we would be under observation for at least six to eight hours. I was not calm driving to the hospital or parking. I was not calm as they attached miniature monitors onto my miniature child: a very tiny pulse oximeter to his big toe, a tiny blood pressure cuff to his leg, and two very tiny electrodes to his chest to keep tabs on his breathing and heart rate. I was not calm. My baby had an anaphylactic reaction to sesame. 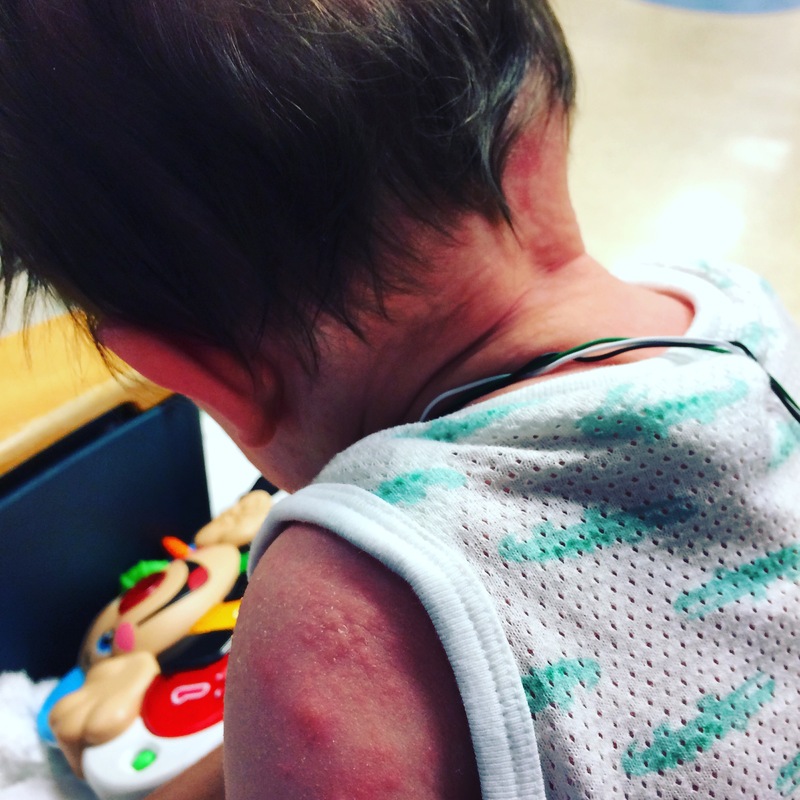 Tiny electrode cords coming over the top with huge, rough hives and irritated eczema. I always thought that anaphylaxis just meant an allergic reaction where someone stops breathing. (I mean, remember that heart wrenching bee incident in My Girl? ) In the ER they told me that anaphylaxis is defined by an allergic reaction affecting two or more systems. In being who can speak, like older children and adults, it’s easier to determine whether or not an anaphylactic reaction is occurring. In babies like A, we had to guess based on the sequence of the reaction. When A ate the hummus he immediately started crying. We had to assume that he was crying for a reason, but we don’t know if it’s that his stomach hurt as a gastrointestinal reaction, or if his mouth, tongue or throat felt itchy or tight, which would signal a respiratory reaction. Something bothered him or he wouldn’t have been upset like that. The second system reaction was the soft tissue one we could see, as demonstrated by Urticaria – the fancy ER word I learned for hives – as well as his face and lips swelling. We would be kept at the hospital and on monitors for 6-8 hours and then discharged if A remained stable. There can be a secondary, rebound reaction that can happen up to three days after an allergic reaction, but they said it usually happens within the first twelve hours. Since I had given him Benadryl at home, we were given an additional round of steroids – which he threw up all over me and the Tula that I am so grateful I had the thought to grab on the way out of the house – and Zantac, which apparently helps an upset stomach and is also an antihistamine. As we settled in I realized how woefully unprepared my diaper bag was. I had a water bottle which A loves to play with (and I highly recommend buying it based on the entertainment factor alone), and I found a pair of baby socks, a credit card and my ear buds. I didn’t have diapers, toys, or pants for my baby who was wearing a mesh tank top onesie. Fortunately, being a children’s hospital they hooked him up with extra baby socks, a blanket to keep him warm, diapers, wipes, books and toys, and snacks, water, and a phone charger for me. They also said that naked babies get brought into the ER all the time so he was already winning in his super cute alligator onesie. Nearly three hours after the initial reaction I sent a picture of his still cute but swollen face to daddy. I learned there were things that I did right in handling the allergic reaction. It was the right move to give him the Benadryl, though in my initial panic I wasn’t sure of the exact dose I gave him, and it was good that I had an Epipen, knew how to use it and gave it to him. It was right that I had brought him into the ER, but I should have called an ambulance as it would have been safer for both of us, and he would have been seen even faster. If something had happened in the car, it would have been much worse and I wouldn’t have been able to help him whereas EMS would have had him monitored. In the stress of the situation I struggled to have letdown for my baby to nurse, but he was so out of sorts that he just wanted to be held and didn’t have much interest in eating. Thankfully, at no point did any of the nurses or doctors guilt me for giving hummus to a baby that had a potential sesame allergy, and now two days later, I’m still feeling guilty enough about that one on my own. 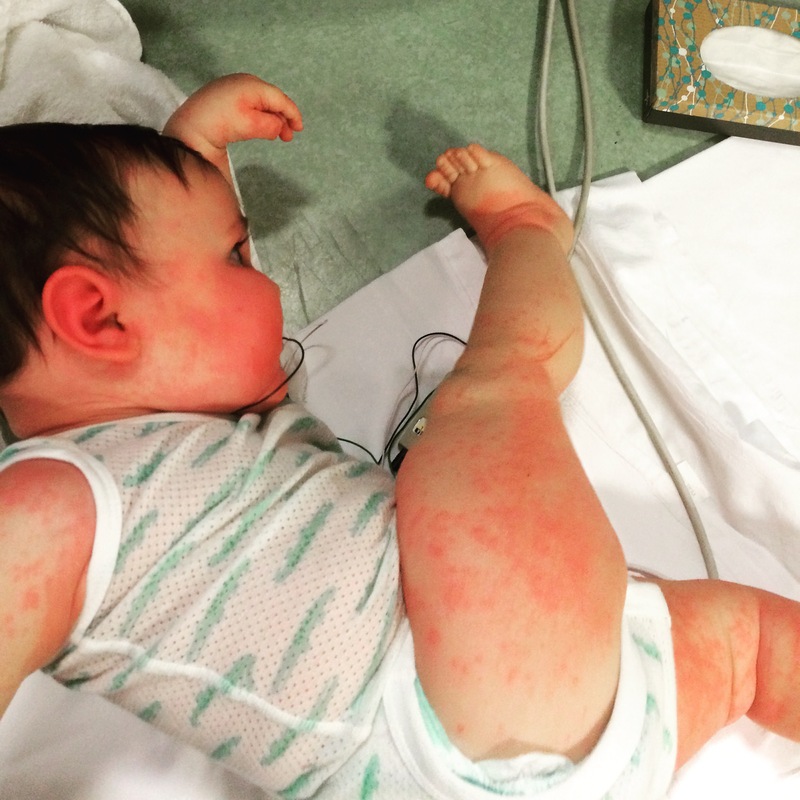 While the skin reaction continued over the next four hours with red, hot hives covering his body in different locations, then moving into little red bumps before gradually easing, he didn’t have a rebound reaction. He was crackhead tired from the epinephrine and the steroids and didn’t sleep for the seven hours we were there, so I wanted to get home as soon as we could. Over three hours later his skin was still reacting. I’m not a jerk taking pictures, these were updates for my husband which is why they aren’t good art shots. We were released seven hours later with three medications and the instructions to follow up with our allergist. Once we were home and he was asleep I could lean on my husband as I crumpled into a crying ball. While I had a friend very kindly bring me dinner, I felt alone in much of the experience of being at the ER. My husband rightfully had to be with our toddler who was rattled by watching the experience of the reaction, the Epipen and me running out of the house for the hospital. My mother, who has been incredibly helpful with my boys, was hours away visiting her other grandsons. My bestie, who is also A’s godmother, was on a lockdown in her building at work due to a bomb threat. She sent out the coordinating email that made dinner appear, and the friends on that email did call and text to offer support. But what I really wanted was someone my baby knows and loves to come hold him so I could fall apart for a few minutes in order to piece myself back together. I took the day off from work yesterday, but there’s no ability to take a day off from parenting. This is one of those times when any number of suggestions in a mom’s group will inevitably end with the suggestion of wine, but I don’t drink so that way of tuning out isn’t on the table. I’m not sure how I feel about the doctor’s suggestion to try sesame at home. I don’t blame her, as the studies are really inconclusive on whether or not a positive skin or blood test will indicate a true allergy, so it seems her advice was right in line with current research. If you’re wondering though hummus contains what is roughly a fuckton of allergenic sesame protein in the tahina. I don’t know if he would have eventually had that reaction to sesame oil or seeds, or if the hummus was just too much too fast. I hope he outgrows this, as sesame is a poorly labeled allergen. Schools are nut free, but they aren’t sesame seed free. My child can’t live in a bubble, as much as I would want him too while he’s still so small and vulnerable. We go to the doctor the beginning of April. I hope I’ll learn more, but I don’t think I will. In the meantime, my toddler has recovered from us being away at the hospital and drama of the situation has just become another story to him, like the one where his friend got a splinter in the yard that we had to talk about it 15,000 times. The baby is doing much better, though he did have hives again last night and he’s all jacked up from the steroids and not sleeping well. I’m still rattled from the experience. I feel tired and emotionally drained. I’m cranky and short tempered with my husband, and I feel anxious around anything the baby touches. I am sure I will be more prepared for the next time something like this happens and I hope it won’t be worse, but I never want to see my baby like that again.